The production of garbage and waste is a huge problem throughout the planet. The creation of waste depletes critical natural resources and its disposal usually creates additional harmful pollution. Disposing of garbage is one of the biggest expenses taxpayers face at the local level. Also, the disposal of waste is often an environmental justice problem as landfills, incinerators and transfer stations are often situated in low-income communities of color. The best way to deal with garbage is to avoid creating it in the first place. Those who create the garbage — the initial manufacturers — need to be held financially responsible for its ultimate disposal. One simple step is to require packaging to be made of reusable or recyclable material. For waste that remains, we should first reuse and then recycle it. The goal is to have nothing left to landfill. The Greens have long opposed the incineration of waste as it emits toxic pollutants, including heavy metals and dioxin, undercuts recycling and costs taxpayers lots of money. The Green national platform calls for a zero waste policy. Zero waste emphasizes waste prevention as opposed to end-of-pipe waste management. Zero waste focuses on restructuring production and distribution systems to reduce waste. In Rensselaer County, located three hours north of NYC, local Greens have helped make a volume based garbage system a major issue. In order to hide a 15 percent tax increase, the mayor of Troy decided this fall to propose moving garbage from the city budget and instead impose a $190 per household fee on garbage disposal. The Democrats argued that such a fee would provide an incentive to reduce the amount of gar­bage. The Greens and the Republicans point­ed out that if you wanted to reduce garbage, you should charge the fee based on how much you throw out while doing recycling for free (Troy only recycles 6 percent of its garbage). The Green City Project of the Green Education and Legal Fund (GELF) had proposed a Pay-As-You-Throw (PAYT) system for Troy 17 years ago. Students at Rensselaer Polytechnic Institute (RPI) had conducted a study of the city’s solid waste program which is available on GELF’s website. The study recommended a volume-based system such as used in Binghamton as well as composting and an improved recycling system. Residents who throw out more garbage to be landfilled would pay a higher rate. The study also recommended overhauling the city’s moribund recycling programs and establishing a municipal composting pickup program. When the Greens re-released the study, it became front-page news and dominated the discussion at the city council meeting. A Pay-As-You-Throw program would be a win-win, both for saving residents and the city money, as well as finally working on the terrible waste problem that is destroying the planet. “A volume-based municipal solid waste program introduces financial incentives to recycle and disincentives to discard recyclables with trash. An increase in the recycling rate means increased revenues for the city from sale of the recyclables, and a decrease in tipping fee expenditures,” said Prof. Steve Breyman of RPI, one of the co-authors of the study. Under a volume-based system, residents are charged for waste collection based on the number and size of waste containers that they use. In some communities, households are charged directly for waste collection (usually through direct billing) based on the number of bags or cans set out at the curb. Others require residents to purchase special trash bags, tags, or stickers that include the cost of waste collection in the purchase price. The Greens pointed out that the city must educate residents about the environmental and economic benefits of a PAYT program prior to implementation. Pamphlets, leaflets, community meetings, and public hearings are all useful methods of increasing public awareness. Education will increase compliance, and should be continued well after the program goes into effect. “A Pay-As-You-Throw program in Troy would be a win win, both for saving residents and the city money, as well as, finally working on the terrible waste problem that is destroying the planet. Many people do not realize Green policies helpful to the environment, actually save citizens money and bolster job growth. The volume-based garbage system is one such example,” said Deyva Arthur, a Troy resident and long-time Green. The Democrats eventually amended their fee proposal to say they would study the implementation of the PAYT system over the next three years. The Republicans — who probably were more motivated by causing problems for the Democratic mayor — balked, saying “we want a PAYT system now, not a promise of possible future action.” Eventually the garbage fee was removed, leaving a $3 million hole in the budget. The real effect was to kick the issue over to the new incoming City Council, which will have a new Democratic majority. Several of them have stated their support for a PAYT system. Other approaches to reducing garbage are being proposed in different parts of the state. The Green Party in Brooklyn helped organize an effort to get rid of plastic bags. New York City spends $12 million annually to dump 10 billion plastic bags in landfills. 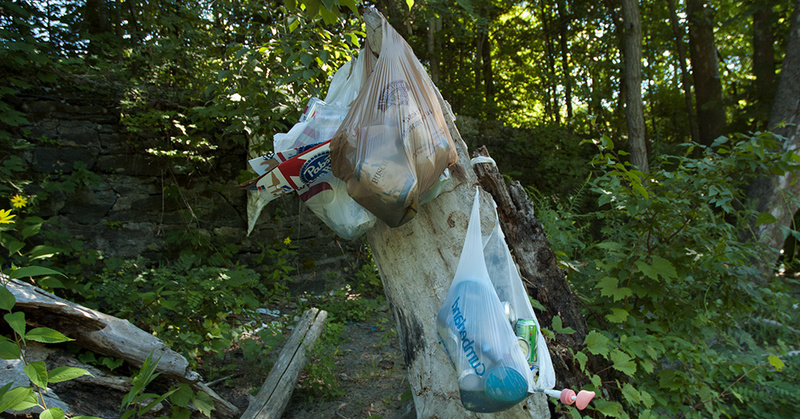 Many more bags get stuck in trees, storm drains, sewage-treatment plants and recycling machinery. Research shows that plastics originating from land account for 80 percent of global marine pollution. Plastic bags never break down. Instead, plastic breaks up into tiny little pieces that end up in the ocean to be consumed by wildlife. There are an estimated 46,000–1,000,000 plastic fragments floating within every square mile of our world’s oceans. While the City’s had limited legal ability to deal with plastic bags due to state law, after four years the Mayor agreed to sign a bill that imposed a five-cent fee on plastic bags (with an exemption for purchases made with food stamps or WIC). The governor and state legislature took the unusual step of blocking the city law under pressure from the plastic bag industry, but the governor set up a task force to make a recommendation for state action by the end of 2017. 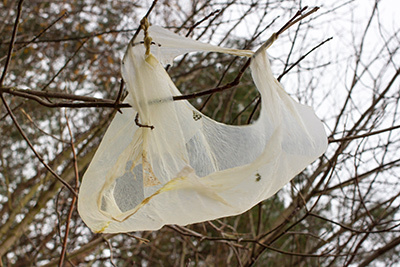 Greens elsewhere in the state have helped enact laws that ban plastic bags or impose a fee. The Green Party is now working for a bill to ban them statewide, with a fee for other bags. Other cities across the country starting with California have cut plastic-bag use by 60 percent or more.